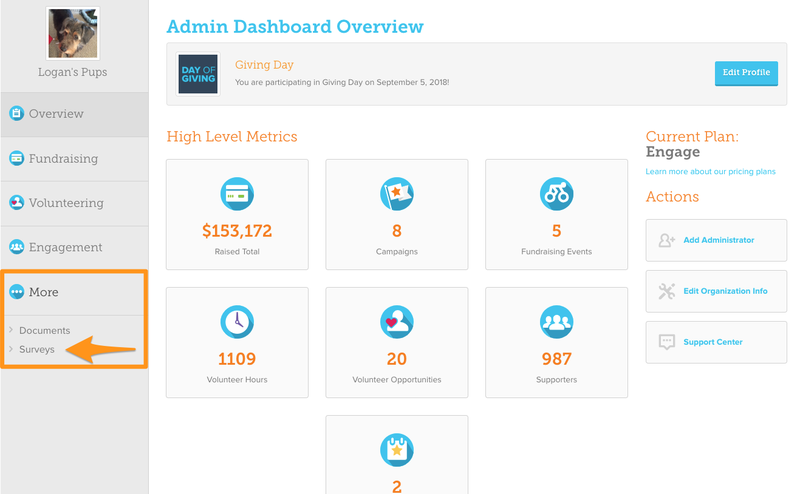 From the "Surveys" section, click the "Create New Survey" button to choose whether you want to create an opportunity specific survey for your volunteers or an organization wide survey for all of your supporters on GiveGab. Once you've made your selection click "Create Survey" to begin building your survey. 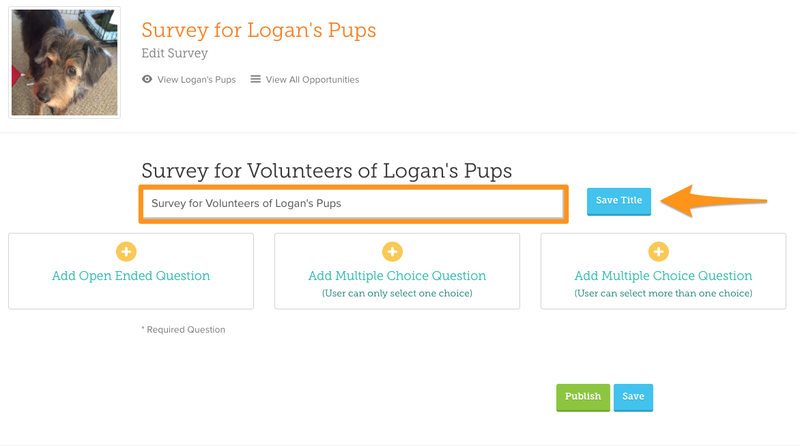 Once you select the type of survey you would like to create you'll be redirected to the survey builder. Here you can customize the name of your survey from the text box highlighted below. Click "Save Title" for your survey name to be updated. 1. An Open Ended Question: Adding an open ended question allows for people to enter a text response to answer your question. To add an open ended question click the "Add Open Ended Question" box and type your question into the text box. If you'd like to make this question required for your survey participants check the box that says "Required". Once you've completed your question, click "Save" and you'll be brought back to the main survey creator. 2. A Single-Select Question: Adding a single-select question allows people to select one of multiple choices that you create. To add a single-select question click the middle box that says "Add Multiple Choice Question". Add your question to the text box, then click "Add Choice" to add multiple choices to your questions. Once your question is complete, click the "Save" button. 3. A Multi-Select Question: Adding a multi-select question allows people to select more than one option from multiple choices. To add a multi-select question, click the box on the right that says "Add Multiple Choice Question". Add your question to the text box, then click "Add Choice" to add multiple choices to your questions. Once your question is complete, click the "Save" button. Once you've added all your survey questions you'll want to publish it so that it's ready to share with your supporters. To publish your survey click the "Publish" button on your survey creator page, and follow the prompt confirming that your survey is ready to publish. Once you click the "Publish" button your survey will be ready to share. From the "Surveys" section of your Admin Dashboard you can view and share your survey by clicking the "view" button beneath the survey listing. You can share the link to that survey page with your supporters for them to fill out on GiveGab. From that page you can also edit your survey questions, export your survey results, or delete the survey.